These words were used to describe the work of Dutch artist Han van Meegeren. 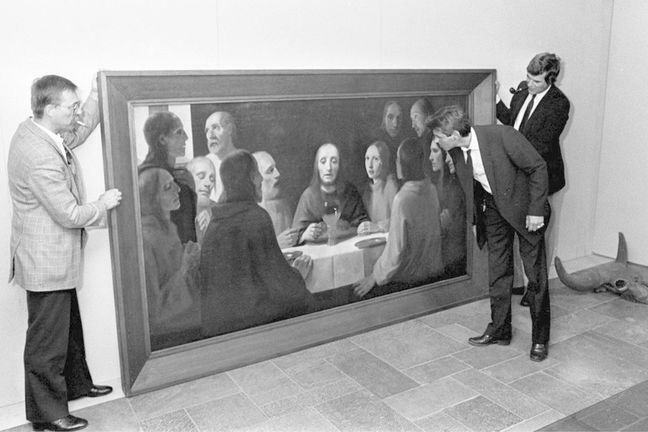 As we will come to learn, van Meegeren is one of the most famous forgers in the art world. His talent for producing and selling forgeries (not only to buyers, but to experts as well) fooled the world, and eventually led to his trial for treason in the aftermath of World War II. 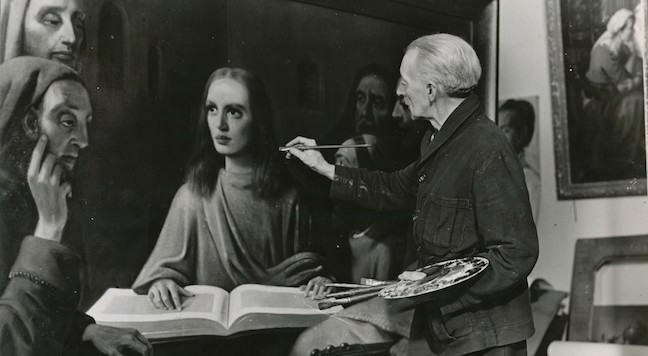 He had a particular talent for forging the works of one of history’s most famous artists: Vermeer. 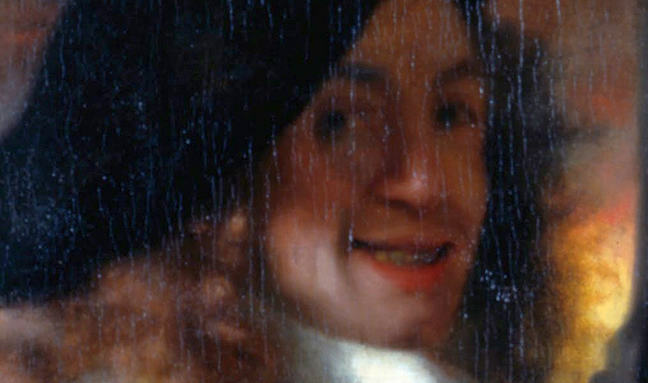 Detail from Vermeer’s ‘The Procuress’ (1656); many people believe it is a self portrait. 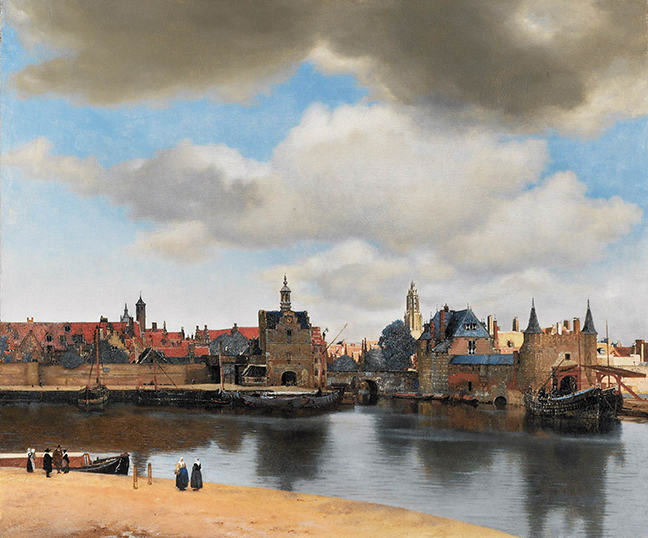 Johannes Vermeer was born in 1632 in the Dutch city of Delft. At the time, Delft was flourishing thanks to the central role of Holland in world trade. As the home port of the Dutch East India Company, we can imagine Delft as being a bustling place to live, filled with first glances at the wonderful goods flowing in from distant parts of the world. Where there is money, there is art, and Delft became an interesting centre for Dutch painters of the period. These days, we call them Old Masters. Details about Vermeer’s life are spotty. We do know that he grew up in a middle class family on a street known for being filled with artists and that his father was a dealer in paintings. We know that he married into money, had 15 children (11 survived early infancy), and that he devoted most of his life to producing paintings in the front room on the second floor of his mother-in-law’s house. Indeed, that room is in many of Vermeer’s paintings. Vermeer had a detailed, meticulous style, using extremely fine pigments to produce realistic paintings that play with light, reflection, and focus. He mostly painted interior scenes with normal people going about everyday activities while bathed in beautiful, perfect light. Because his paintings are so realistic, many have speculated that he used some sort of aid to paint them: mirrors, precursors to cameras. Others believe that Vermeer worked from his talent alone. Vermeer’s perfect, heavenly use of light. Because his paintings took so very long to make, he did not produce very many of them. Today we know of only 34 paintings by his hand. In comparison, we know that Van Gogh produced over 2000 artworks in only 10 years; Picasso produced around 50,000 artworks in his lifetime. There are not many Vermeers to go around. Those that we have are adored. Thus we have a situation where paintings by Vermeer are very desirable and very rare. Furthermore, because of the lack of records about Vermeer’s work, it is almost certain that he produced more paintings than we currently know about. It is not inconceivable that someone out there has a Vermeer in their ancient attic and doesn’t know about it. It is this sort of possibility that an enterprising forger exploits. Han van Meegeren was a mid-level Dutch artist who would later become known as one of the world’s greatest forgers. Although he was born in the city of Deventer, he loved the Old Masters of the Dutch Golden Age and eventually moved to Delft to study art; he continued his art studies in The Hague. He started out as an art teacher, but later attempted to support his family solely through his artwork. While a perfectly adept painter, his abilities were often reviewed by contemporaries as simply decent or adequate. He favoured the naturalistic and realistic styles, and wholly rejected the modern and abstract art movements that were popular at the time. It is difficult to sell unpopular art and, unfortunately for van Meegeren, critics viewed his art as displaying technical talent, but lacking in artistic originality. These negative reviews by critics drove van Meegeren to initially write angry letters and articles, but ultimately drove him to get back at his critics by fooling them with forgeries. Van Meegeren was convinced that modern and abstract art movements were merely “passing fads”, and once their initial appeal was overcome, public interest would return to more traditional styles of art. This belief may have played a part in van Meegeren’s ultimate decision to produce forgeries of the Old Masters that he respected. Van Meegeren did not “dip his toe” into the world of forgeries, but plunged into it by setting his sights on painting a convincing Vermeer. As the importance of Vermeer’s work was not appreciated until after his death, many of his works were sold for minimal amounts and tucked away in discreet corners of galleries and homes. As a result, the presence of a previously undiscovered Vermeer would draw significant attention from all realms of the art world. 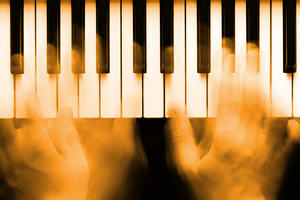 Traditionally, forgers attempt to avoid scientific and expert analysis. Van Meegeren was striving for exactly the opposite. It seems his main motivation for creating the forgery (beside the profit) was a deep desire to humiliate art critics and the art world on a global stage. While he may not have been one of the leading painters of his age, van Meegeren was successful in producing forgeries that fooled the world. Van Meegeren’s true talent was in producing forgeries that appealed to the experts by giving them exactly what they wanted without being too obvious about it. Then and now, to discover a previously unknown Vermeer could make or break an expert’s career in the art world. Having a ‘new’ Vermeer practically fall into the lap of well established and respected art critics proved to be more than they could resist. They wanted what van Meegeren was offering. The forger excelled in creating “original” Vermeer works by drawing upon styles and techniques that were familiar in other Vermeer paintings. Some artists will create multiple paintings of the same composition or subject matter as a means of perfecting or testing different methods and techniques. It is not implausible then, that if a new Vermeer appeared on the market, and had a distinctly “Vermeer”-like quality to the faces, lighting techniques or subject matter, that experts would declare it to be genuine. 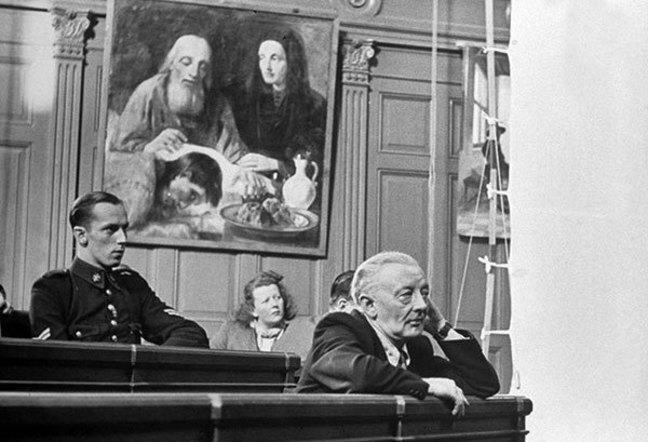 The unique paints used by van Meegeren to imitate Vermeer’s techniques were used as evidence at his trial (photo by Quistnix). Van Meegeren’s process for ultimately producing a forgery was long and complicated. It took him years to perfect his technique, and to determine the best way to pass a forgery off as a true Vermeer. For a number of years he lived in Nice, France and toiled at creating first sketches and then paintings. Not only did he have to overcome the hurdle of actually painting a Vermeer, but he had to develop special techniques which would allow him to accelerate or fake the aging process of the painting. Additionally he had to ensure that the painting could pass any scientific testing that it might face. He perfected his skill of drying the painting in the oven to create the appropriate amount and type of cracking of the paint, but also had to consider the paints that he used, the canvas or wood panel, and even the type of brush used to paint the work. Vermeer used specific brushes of badger hide that he made himself: you can’t buy those at your typical artist’s supply store. Eventually van Meegeren had a “Vermeer” that would fool the world. In 1937, Han van Meegeren, through a lawyer-friend, had his forgery brought to art critic and renowned Vermeer expert Abraham Bredius. 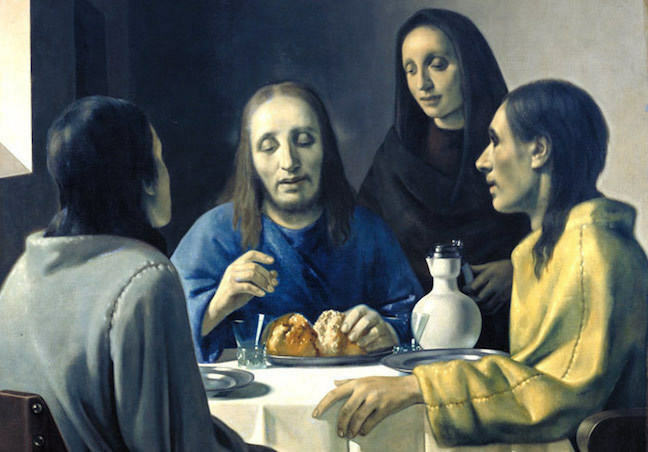 Van Meegeren’s forgery “The Supper at Emmaus” passed this test with flying colours. Not only did Bredius declare it to be a genuine Vermeer, but he also claimed it to be one of the finest of Vermeer’s works. One of the main techniques that let van Meegeren’s forgeries stand the test of experts and science was his use of Bakelite, a synthetic resin. Van Meegeren would use this product to mix his paints instead of more traditional oil. Oil paintings take years to fully dry and a recently created artwork in oil is significantly wetter than a 400 year old master painting. Everyone can tell the difference. Van Meegeren’s use of Bakelite allowed the fresh oil paint, when cooked in an oven, to harden and dry so that the painting would appear old if it was ever tested. Van Meegeren’s forgeries netted him an estimated $30 million USD. 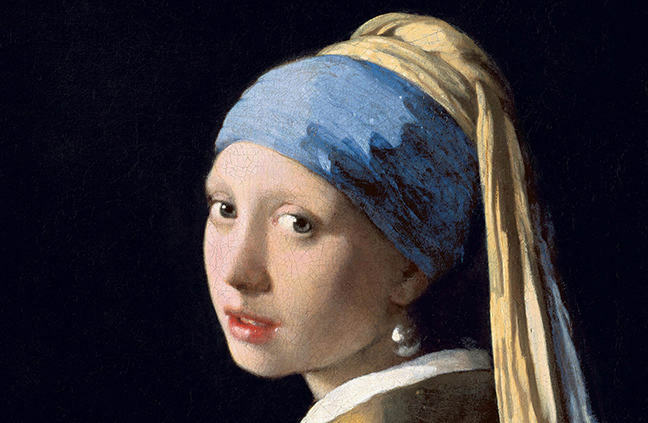 The Vermeer forgeries were so convincing that they were never actually detected by experts. On the contrary, van Meegeren gave himself away. In the spring of 1945, the post-war Dutch Government charged him with “conspiring with the enemy” after authorities tracked down his involvement in possible art transactions with high-ranking Nazis. Better to be a forger than a traitor, van Meegeren confessed. If not for his full confession, we might still consider his “Vermeers” to be authentic. His downfall came from one simple transaction. During World War II, Nazi leader Hermann Göring was renowned for “collecting” art from countries which had fallen to the German army. He pillaged the Louvre in Paris, and sought famous and precious works of art from all over Europe, many of which were in the collections of Jewish Holocaust victims. When the Netherlands was invaded by the Germans in 1940, Göring expressed interest in procuring artworks from the country, particularly the Old Master paintings that both he and Hitler loved. It was recorded that van Meegeren, via a third party, had sold a Vermeer to Göring. In other words, he knowingly profited from business with the Nazi top brass. Van Meegeren was brought to trial for selling what was then essentially considered to be a national treasure. Initially, the trial seemed set against van Meegeren. It was a cut and dried case: he sold a Vermeer to the Nazis without being forced to. But then came the twist. Van Meegeren confessed to selling Göring a painting, yes, but that painting was not a national treasure. Far from it, it was fake that he produced. According to van Meegeren, he didn’t conspire to aid the Nazis at all, but rather tricked them into taking a worthless fake. The painting which van Meegeren sold to the Nazis was “Woman Taken in Adultery“, a forgery of a “new” Vermeer. Van Meegeren testified that he traded his forgery for approximately 127 works of Dutch art, which would have otherwise stayed with the Nazis in Germany. He would later argue in his trial that he was not a traitor, but a patriot who used his talent for the good of the country. This proclamation drew national and international attention, and caused van Meegeren to have the fame, even if only for a short time, that he had craved as an artist. At first, art experts refused to believe van Meegeren’s story because it would mean that they, too, had been duped. Even if they might have doubts when the claim was made, they could not bring themselves to retract the praises they once sung of his “Vermeers”. Van Meegeren’s painting “Supper at Emmaus” was considered to be one of the most important “Vermeer” discoveries of the 19th century, as this painting, to art experts, helped to link two distinct style changes within Vermeer’s career. Again, it is the Vermeer they wanted, the Vermeer they expected, and the Vermeer they believed in. 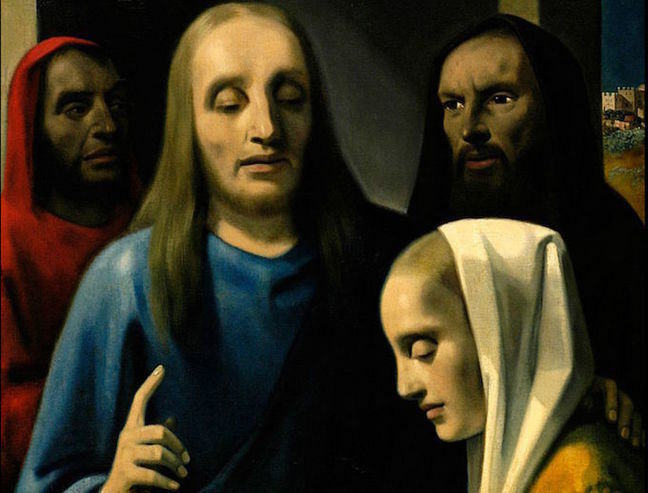 In order to prove that he was indeed the forger, under police supervision, van Meegeren painted a new forgery, which he called “Jesus Among the Doctors”. This caused a minor media sensation. 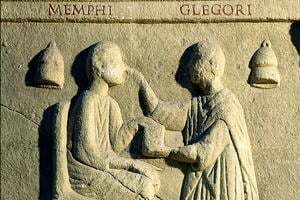 Eventually the charge of conspiring with the enemy was dropped, but van Meegeren was found guilty of the lesser charge of forgery. A month after the trial, van Meegeren died of heart disease at age 58. 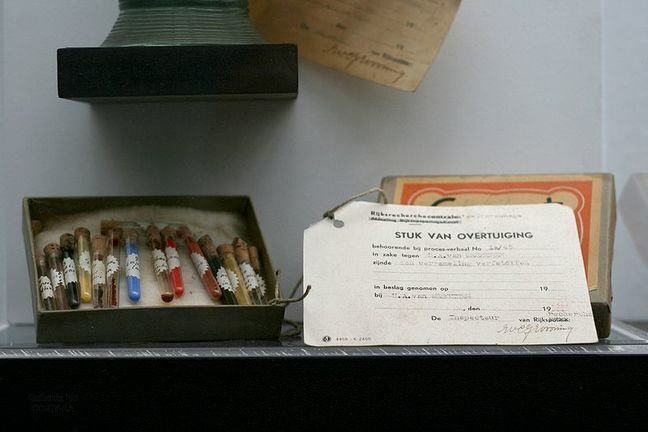 The case of van Meegeren is unique in the history of forgeries, as it is one that encompasses a world war, and one forger’s claim for using his talents to save his country’s national treasures. While his works are passable, many people these days, even those untrained in art, would most likely be able to tell the difference between a van Meegeren forgery and a real Vermeer. 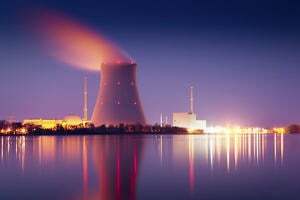 It seems surprising that the experts were duped. Furthermore, van Meegeren produced a number of other forgeries that were accepted by the art market. Though he favoured Vermeer, he also tried his forger’s hand at the style of other Dutch Old Masters such as Pieter de Hooch and Frans Hals with some success. This raises the question: how was van Meegeren able to pull off such an incredible accomplishment? He mastered the technique of “selling” the painting, and creating the aura of “Vermeer” around a work so pronounced that its influence, and ultimately deception, fooled everyone.